Assateague Island National Seashore is a barrier island situated on the Maryland/Virginia border. There are two entrances to Assateague Island National Seashore. The north entrance is at the end of Route 611, 8 miles south of Ocean City, MD; the south entrance is at the end of Route 175, 2 miles from Chincoteague, VA. There is no vehicle access between the two entrances on Assateague Island. Vehicles must return to the mainland to access either the north or south entrance. This 37-mile barrier island, with sandy beach, migratory waterfowl, and wild ponies, consists of three major public areas: Assateague Island National Seashore, managed by the National Park Service; Chincoteague National Wildlife Refuge, administered by the US Fish and Wildlife Service; and Assateague State Park, managed by the Maryland Department of Natural Resources. First-time visitors should stop at the visitor centers to see exhibits and obtain information about the many recreational activities and natural features in the seashore. Activities include camping, hiking, swimming, boating, kayaking and canoeing, fishing, clamming and crabbing, hunting, and off-road vehicle use. Seasonally, a wide variety of guided programs can be enjoyed to enhance your visit. Maryland District - open year round, 24 hours a day. Barrier Island Visitor Center open 9 am - 5 pm every day except Thanksgiving and Christmas. Virginia District - January-March: 6 am - 6 pm. April: 6 am - 8 pm. May-September: 5 am - 10 pm. October: 6 am - 8 pm. November-December: 6 am - 6 pm. Visitor centers open 9 am - 4 pm every day except Thanksgiving and Christmas. Assateague Island National Seashore was authorized on September 21, 1965. Located just south of the National Seashore, the Chincoteague National Wildlife Refuge includes more than 14,000 acres of beach, dunes, marsh, and maritime forest. The refuge's location along the Atlantic Flyway makes it a vital resting and feeding spot for a large number and diversity of birds, and it is considered to be one of the top five shorebird migratory staging areas in the United States, east of the Rocky Mountains. 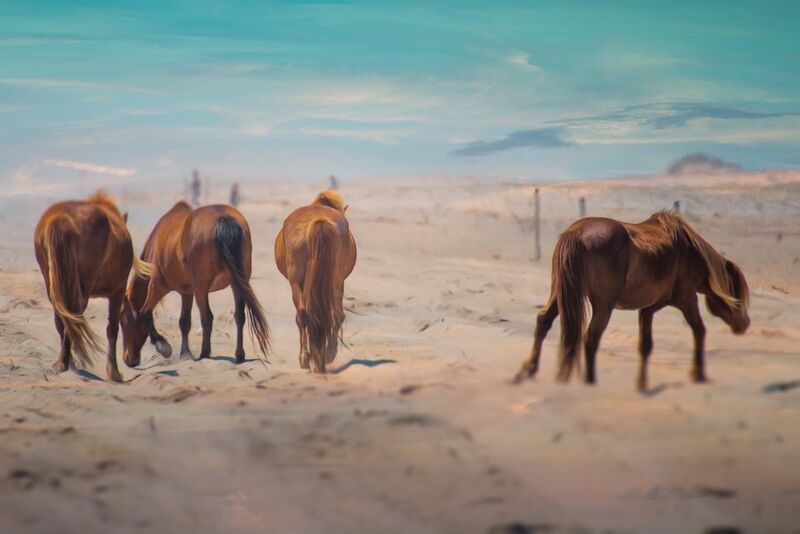 Located just north of the National Seashore is Assateague State Park, Maryland's only ocean park. Two miles of ocean beaches offer swimming, beachcombing, sunbathing, surfing and fishing. The island's bayside offers visitors the chance to explore secluded coves by canoe or kayak. The marsh areas have a variety of wildlife, including deer, waterfowl and feral horses. Assateague Island National Seashore is a barrier island situated on the Maryland/Virginia border. There are two entrances to Assateague Island National Seashore. The north entrance is at the end of Route 611, 8 miles south of Ocean City, MD; the south entrance is at the end of Route 175, 2 miles from Chincoteague, VA. There is no vehicle access between the two entrances on Assateague Island. Vehicles must return to the mainland to access either the north or south entrance. Maryland District - open year round, 24 hours a day. Barrier Island Visitor Center open 9 am - 5 pm every day except Thanksgiving and Christmas. Virginia District - January-March: 6 am - 6 pm. April: 6 am - 8 pm. May-September: 5 am - 10 pm. October: 6 am - 8 pm. November-December: 6 am - 6 pm. Visitor centers open 9 am - 4 pm every day except Thanksgiving and Christmas. Located just south of the National Seashore, the Chincoteague National Wildlife Refuge includes more than 14,000 acres of beach, dunes, marsh, and maritime forest. The refuge's location along the Atlantic Flyway makes it a vital resting and feeding spot for a large number and diversity of birds, and it is considered to be one of the top five shorebird migratory staging areas in the United States, east of the Rocky Mountains.